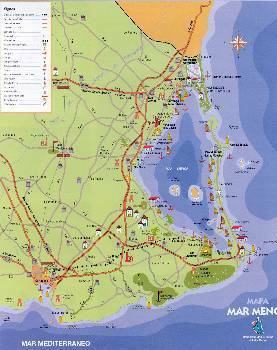 The descriptive name of La Manga (the sleeve) holds an interesting geographical layout which has become one of the symbols that best identifies the coast of Murcia as a tourist resort: a continuous chain that stretches along approximately 24 km from Cabo de Palos to the Punta del Mojon, and it is the natural limit of the salt water lake known as the Mar Menor. 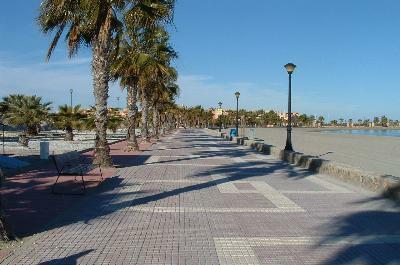 Originally, what is now known as La Manga del Mar Menor was a bay open to the Mediterranean; at either end, volcanic reefs gradually held back the sane and sediment that was dragged along by the sea currents to form a sandy column of dunes and rock vegetation and long beaches in contact with two seas: the Mediterranean and the Menor. 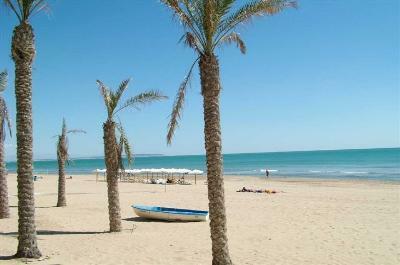 La Manga is a narrow piece of land with a width that varies between 200 m and 1.5 km. It is dissected by natural channels that keep the two seas in contact with each other; these are called "golas" and they allow water from the Mediterranean to flow in and out of the Mar Menor. The area was kept virgin until the 60's when La Manga started to be developed as a tourist area, since that time it has undergone continuous transformation which included the urbanisation of the area and the provision of the necessary infrastructure. At the present time everything in La Manga is in place to make it an enjoyable place to visit or live, and the variety of sporting and leisure opportunities are unlimited. If it is Local Hotel Information you need then you will find it at They have a list of nearly 30 Hotels in The La Manga area. Listed below are a few contacts in areas where you can rent local villas and apartments. To name just a few there are marinas, sailing schools, three golf clubs, and every kind of water sport imaginable is available on the beaches during the summer, including scuba diving, wind-surfing and jet ski. The entire coastline offers a series of places that are ideal for diving, in particular Cabo de Palos and the area next to Isla Grosa. There are supermarkets, shops, banks, doctors, bars, discos....everything you need for a pleasant stay, be it long or short. In Autumn and Winter, La Manga is "open" as many people want to take advantage of its mild climate to relax or practice their favourite sports, and this is an ideal period for those in search of peace and quiet. The entire area of the Mar Menor and La Manga enjoys the exceptional climatic conditions of the area, 315 days of sunshine per year and a mean annual temperature of 18dgC are ideal for the practice of sports or just chilling out and relaxing. 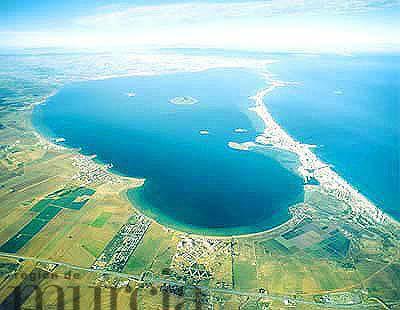 Whether you want to call it a large lake or a small sea the result is the same, throughout history, the Mar Menor has had different names, all of which take into account the geographical characteristics of the area that nature designed as a great coastal lake (originally, an open bay) of 170 sq km of warm saltwater. Ever since ancient times, the abundance of its water, the benign climate and the beauty of the area as a whole, has attracted many people. The Iberians and Phoenicians and, later, the Arabs have all at different times, inhabited the area known as Mar Menor. In the Moslem period, it was known as the Mar Chico, and the place known today as Los Alcazares, from the Arabic 'Al-Ksar', which means "place of residence", was chosen by them as an area for relaxation. The ongoing battles with pirates from Algeria led them to construct watchtowers, or atalayas, some of which are still exist in the present day, for example that of El Rame or Rami. Until the 18th Century, the area was occupied only by people who earned their daily bread by fishing and to the exploitation of the salt flats. From the 19th century, these centres gradually became centres for recreation and relaxation for the inhabitants of La Huerta, who established their summer residence next to the coast, attracted mainly by the curative properties of its water. Even today, the Mar Menor remains faithful to the concept of residential area and it is an area of serenity and leisure. If purchasing a Holiday home here on the Mar Menor interests you and you are looking for property with all round stunning views of both seas you should visit this page they have 1, 2 AND 3 Bed properties available. 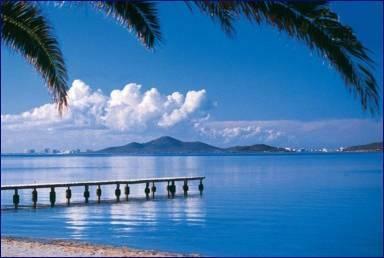 The warm waters of the Mar Menor, with a maximum depth of 7 metres, have ideal conditions for sailing and golf. La Manga de Mar Menor is well connected with the rest of Europe through the airports of San Javier in Murcia, which is less than an hour away by road, and Alicante International Airport, which takes about an hour and a half to reach by car. 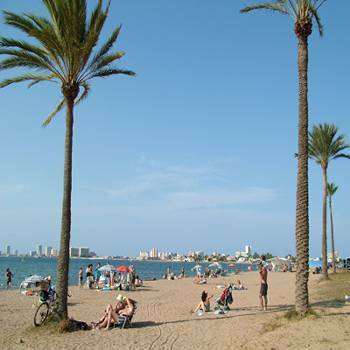 La Manga de Mar Menor accesses the N332 highway which runs right up the Costa Blanca throughout the provinces of Murcia and Alicante, and at the city of Murcia one can drive on to the A7 motorway which goes right along the Mediterranean coast of Spain. There is a train from Murcia to Madrid and also one to Valencia, and there are numerous local bus services. 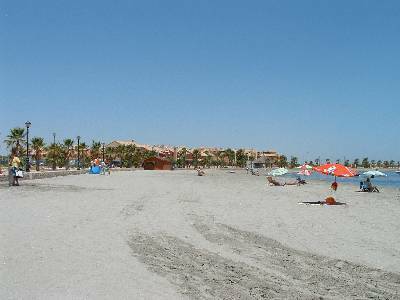 Playa de los Nietos is a small purpose built community set by a beach of fine, golden sand, which is 3 km. long. It is accessed at km. 7.9 of La Manga main road. It is part of the Municipality of cartagena which is the nearest large town. Playa Honda is part of the area known as Rincon de San Gines, it has a wide beach of 700 km in length, which is bordered by an ample promenade. Again it forms part of the Municipality of Cartagena. Playa Cala Flores is situated in Cabo de Palos, which is a small peninsula 400 m wide. It is a residential area close to a small cove with access to the beach by ramps. The waters around Cabo de Palos form one of the most important marine reserves in the Mediterranean, and it is an ideal place for scuba diving, with underwater scenery of exquisite beauty. It is connected by bus on the Alsa line from Cartagena to La Manga, and the Alsina-Graells line from La Manga to Murcia. The above three areas are all ideal for year round living, or for holiday properties and investment purposes. La Manga de Mar Menor is an area which is relatively unspoilt and it is a year round paradise for sport and cultural events. Properties here are still reasonable but can only increase in value in the near future. If you are interested in the local wildlife then you should pay a visit to The salt flats in San Pedro del Pinatar form the most important wetlands in the entire region. Regional Park San Pedro del Pinatar. These were declared National Park in 1985.